As Thanksgiving approaches, in this 8X10 oil on canvas board I tried to capture the fall colors of the mini-pumpkins seen against the green shades of the sage leaves. I feel that the leaves need a little more work but I like the multiple tones in the pumpkins as they lay against each other. I will be attempting three paintings this size for mor practice on still life painting with the remaining two being a grouping of apples and a grouping of cherries. I guess the annual feast has inspired thoughts of other foods. 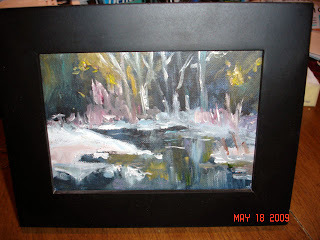 This original oil 11X14 on canvas was inspired by a late fall trip to Heald Pond in Pepperell, MA. The pond surface was mirror-like and the changing colors of the leaves contrasted well against the evergreens in the background and the sky. This painting has sold. 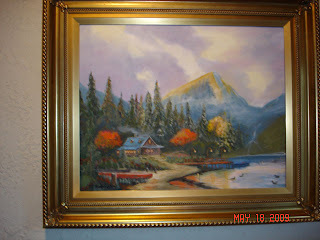 This painting completed on September 28th, 2009 was inspired by the current peak foliage and is 18x24 Oil on Canvas. It is my interpretation of an original entitled Autumn Lane by Kinkaide. I like the effect of the light shining through the trees from the left side. I feel like I have walked this lane many times in past Autumns in Westford where I make my home. This painting was my second summer challenge in that I wanted to try painting human skin tones in hopes that at sometime I would paint a portrait. Many artist friends have told me that portrait painting and human skin tones are the most difficult to attempt because of the many values (color variations) and shadows. I am reasonably pleased with the result which I call "Quiet Contemplation". I thought for my first attempt at this subject I would choose a side view and not attempt to paint a face straight on. 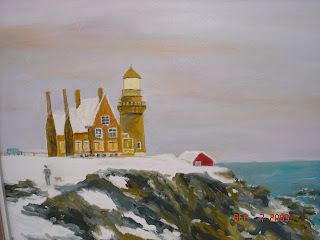 Currently I am working on a painting of Block Island Light after another painting by Thomas Kincaide. This work is being done in my weekly painting group supervised by the same artist, Marie Stabile, that I worked with last winter. I feel that working on this seascape with lighthouse has many possibilities for learning values, brush strokes and composition. As usual there is a great deal to learn. I continue to attend my weekly Nashua Artists Breakfast Club meetings where I am like a sponge absorbing tips and ideas from the varied and more accomplished artists in this group. Conversation is always lively and the pastry and cappuccino is a bonus reason for attending. I hope either late this summer or early in the fall to attempt a "plein air" painting as another challenge... I will post a picture of the lighthouse when I am finshed with this latest challenge. Well it has been a while since my last post, not because I have stopped painting but because I have procrastinated posting. In summer that is easy to do and I have been busy officiating at weddings in my other role as Justice of the Peace. As I mentioned in my last post I was working on a painting of my two toy daschunds, Gracie the small brown female and Budso the black and tan male. I found this task more difficult than I expected but it was a challenge I wanted to accept. I found that painting the eyes was particularly difficult for me. The end result is that I think I produced a reasonable representation for my first try at animal portraits. In the last few days I have been working on a painting of my two dogs Gracie (the little brown female) and Budso (the larger black male). My first attempt at painting dogs and one that I have found to be frustrating. I particularly had a great deal of trouble with their eyes. 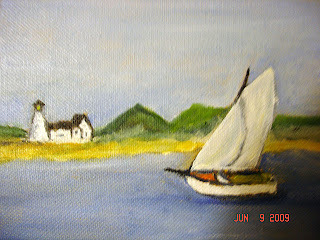 In the meantime I painted this 5X7" oil on canvasboard which I call "Lazy Summer Sail. I will post the dog painting in the next few days because it is finally nearing completion. This is another of my half-hour paintings which I call simply "Red Barn in the Snow" This workshop really got me to produce using pretoned canvases and without laboring over the under-drawing before starting to paint. 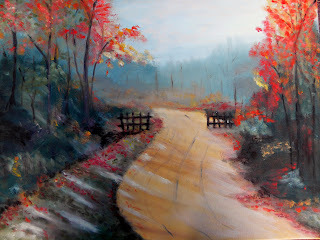 Such a workshop helps a painter to not be intimidated by a blank canvas because of the time constraints that are imposed. A wonderful learning experience that I highly recommend to new painters and to those who are used to spending many hours on their paintings. 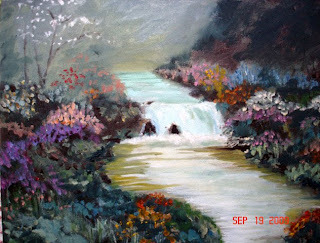 The third of my half hour paintings is a 8X10 oil on canvasboard which I simply call "Winter Snows"
Another of my half hour creations is this 5 X 8 oil on canvas which I entitled "Spring Arives" A simple woodland stream at the beginning of the spring after a long hard winter. 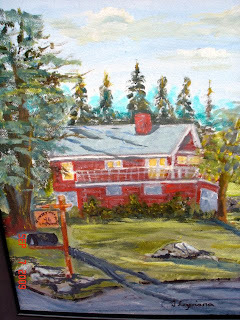 In April of 2009 I attended a workshop led by Steve Previte of the Nashua Area Artists group which Steve held at the Jaffrey Civic Center in Jaffrey New Hampshire. During the course of this day we produced the beginnings of five paintings each painted in one half hour. The purpose of this exercise was to loosen up the painter's style. Many of the paintings produced were in a more impressionistic style than I had previously worked on. 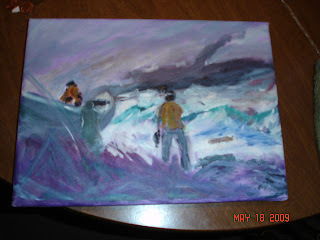 This painting which I simply call "The Fishermen" is one of my paintings from this day. It is a 10 X 12 oil on canvas. On the southern coast of Sicily can be found the Baia dei Mulini below the town of Erice. In the summer of 2005, I visited this wonderful spot to admire the remaining windmills which were originally used as they still are today to pump salt water on flats where it is dried and milled into salt for the dining tables of Sicily. This original is an 8 X 10 on canvas board. A first attempt at a still life inspired by a quiet bite to eat in the middle of the day. 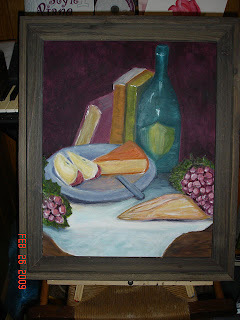 Who could desire more than a good book, ataste of wine and cheese, crusty italian bread and some fruit. This is a 16 X 20 oil on canvas original. Another 8X10 oil on canvas board. 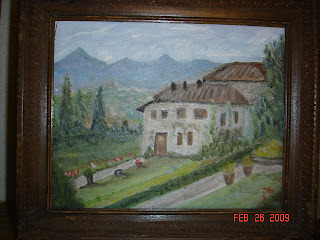 This is a typical Tuscan Villa that I completed on an 8 X 10 canvas board in February 2009. In the small villages of Italy and Sicily the village fountain is the central location where villagers met to discuss the days activities and news. 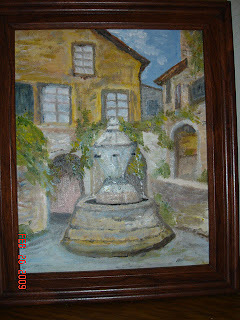 This painting is of such avillage fountain in Tuscany. 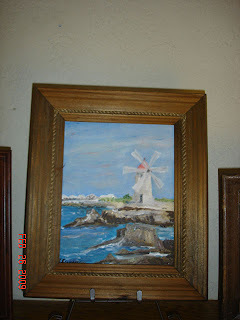 This is an original oil on canvas board This is an 8 X 10 on canvas board. 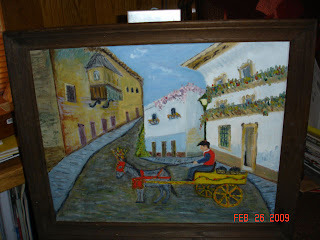 Inspired by all things Sicilian i completed this 16 X 20 original oil on canvas which captured a Sicilian farmer returning in his donkey cart from the vinyard. In this area the rich red Nero d'avola vines produce a deep red wine with flavors of black currants, and plums. This 16 X 20 original oil on canvas was inspired by my visit to a small town in South Central Sicily called Mazzarino. It was in this town that my mother was born in 1912. 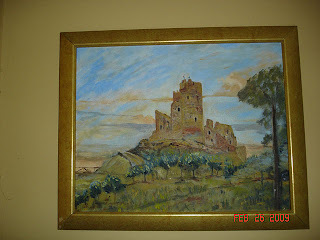 The subject of the painting is Il Castello (The castle) UCannoni which dates to the 14th century and occupies the highest point in this small town. I decided to reframe my copy of the Kincaid called "End of the Day" I feel that the gold frame draws the tones in the painting forward. In this my second painting, a copy of an original by Kincaide called "End of the Day" my coloring is significantly different. 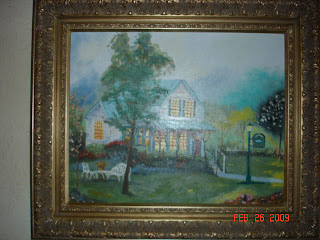 The painting was produced in a class taught by Marie Stabile. Working for a second time in the new medium of water mixable oils has convinced me to continue in this medium . This is the second painting that I completed. It was completed in December 2008 in a second class taught by Marie Stabile. The subject was an original by Kincaide called "The End of the Day" In my painting the coloring is changed significantly, however, working again with water mixable oils this painting further convinced me to continue in this medium. This was my first attempt at painting after a 30 year hiatus. The painting is a copy of a painting by Kincaide in which I took some artistic liberty and changed colors and some of the objects in the composition. Being quite pleased with the results, I was encouraged to continue using this water mixable oil medium. This painting was completed over a six week period in a class taught by artist Marie Stabile in the winter of 2009. Welcome to my blog. Since this is my first attempt at this new endeavor, please bear with me as I develop my blog and interest in writing about my painting experiences. 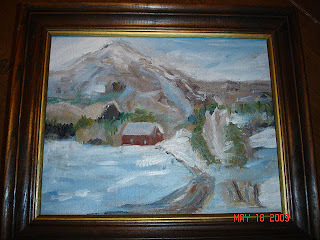 I have begun oil painting again after not working in this medium for more than 30 years. I have decided to work in the relatively new medium of water mixable oils. Working in this medium I feel is a safer alternative to traditional oil painting in that this medium reduces exposure to volatile fumes and chemicals and makes traveling with supplies easier since there is no need to use paint thinners or turpentine. These paints will mix and clean up with water. The medium is possible since paints have been developed with modified linseed and safflower oils. The paint consistency is similar to traditional oil paints and paints behave in a similar manner. The depth of color, buttery consistency, lightfastness, opacity/transparency,drying time and performance allows use in all color techniques. To date I have found no limitations in this newer medium. 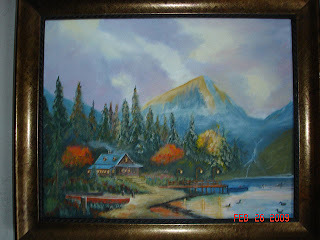 I have been using Winsor and Newton Artisan paints.